These Beaded Heart Decoration Craft Kit for kids comes with enough craft supplies to make 12 of these heart crafts. You get heart shaped beads, googly eyes, and foam heart shaped cut outs and circle shaped cut outs. These Valentine craft supplies are packaged in individual packages and come with the instructions you will need to complete the crafts projects. Just click right on the picture of this completed Beaded Heart Decoration to find out more information about this and other kids craft kit ideas. Won't these make a great Valentine craft ideas make a fun party activity and party favor? First let the kids make them and then each child gets to take the one they made home. Now that's a great way to entertain and thrill your little party guests, and save money too. Whether it's a Valentines Day party or a kids birthday party in the month of February...heart party supplies and decorations and heart crafts for kids make a perfect combination. Join in and write your own page! It's easy to do. How? 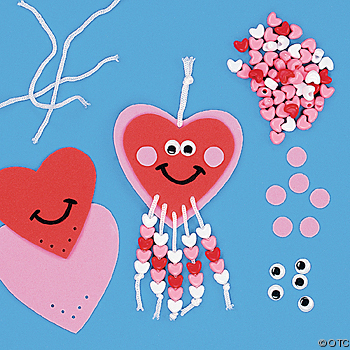 Simply click here to return to Valentine Day Crafts For Kids.